There will be a release party for RETROFUTURE 8 (the last issue ever) in Östersund (Jämtland County) at Jane Doe on March 4, kicking off at 19.00. People can just pop in, have a few beers/drinks, listen to great music (lots of Kiss & Deep Purple for sure) and grab a magazine (or two) free of charge. 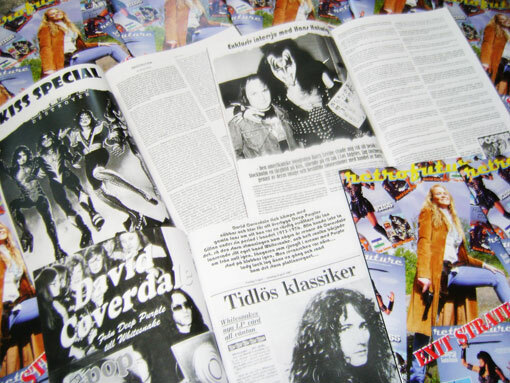 Details will follow on this blog, but I can say that drummer Björn Höglund, one of the authors for the Kiss Special in this issue, will be one of the DJ´s for the night. Jane Doe was the club that sported the great Deep Purple party I had back in November 2013, so this is the perfect location for this. RETROFUTURE 8 sports a Kiss Special (including an exclusive interview with legendary POSTER/OKEJ publisher Hans Hatwig), with writers such as Michael Mojo, Björn and Chris Laney adding their magic. There´s also some David Coverdale & Whitesnake stuff, some Judas Priest and Deep Purple. The rest is what it is, it really is one hell of an issue.